Turkey and Armenia: Thaw in a Century-Old Feud? This summer, Turkey celebrated a dubious anniversary: it was 50 years ago that the country first asked to join the European Union  or, as it was then known, the European Economic Community. Half a century on, Turkey is still waiting to be let in. In that time, other countries have joined, expanding the once six-member European club to 27. But even the most optimistic scenario says Turkey is unlikely to be part of the E.U. for at least another decade. Turkey's leaders say they remain committed to their bid, however long it takes. But patience might not be enough, according to a report published Sept. 7 by a panel of European grandees. Chaired by former Finnish President Martti Ahtisaari, who won a Nobel Peace Prize for his work as a mediator, the Independent Commission on Turkey says some E.U. leaders are mining popular fears over the specter of Turkish membership. "Attacks on the E.U.-Turkey process [have become] a proxy for popular concerns about immigration, worries about jobs, fears of Islam and a general dissatisfaction with the E.U.," the report says. "Negative statements by some European leaders ... and obstacles put in the way of the negotiations have all but derailed the process." Although the report does not mention them by name, it clearly targets French President Nicolas Sarkozy and German Chancellor Angela Merkel, who have both said that Turkey can never be allowed to join the E.U. The two leaders came to power after the E.U. 's unanimous decision in 2004 to formally start accession talks with Turkey. But they instead talk of Turkey having a "privileged relationship" with the E.U. rather than full E.U. membership. This hostility has not been missed by the Turkish. Support in Turkey for membership fell from over 70% in 2004 to 42% by the end of last year. The sense of being excluded has further demoralized Turkish reformers, the report says, leading to "a regrettable slowdown in the reform process" that is a condition of membership. This, in turn, feeds skeptics in European countries who point to the lack of reforms as proof that Turkey is unworthy of joining the E.U. It's a vicious circle that jeopardizes Turkish domestic reforms and hurts the E.U. 's own interests in the region. Turkey itself has to take some blame for the impasse. Since the ruling Justice and Development Party came to power in 2003, it has been jostling with the army, raising fears of a military coup. Speaking in Brussels in January, Turkish Prime Minister Recep Tayyip Erdogan admitted the crisis had delayed E.U. accession talks. The report by the Independent Commission on Turkey says the country still needs to shed its "authoritarian legacies." In four years of actual accession talks, Turkey has opened only 11 of 35 policy chapters that need to be negotiated, successfully closing just one, on science and research. This is partly due to the issue of Cyprus, still divided between Greek and Turkish sides: eight of the chapters are formally blocked because Turkey still refuses to open its ports and airports to traffic from Greek Cyprus. As its European horizons keep getting pushed back, Turkey has moved to build up its relationships in the Middle East. The country is a transit route for Europe-bound natural gas from Central Asia. And it has forged alliances with Syria, Iraq and even Iran (after the contested June elections, Turkey was one of the first countries to congratulate President Mahmoud Ahmadinejad on his victory). It's exactly these initiatives that could make Turkey even more valuable for the E.U., which is trying to boost its clout in the Middle East. "The E.U. is losing leverage in Turkey, just as Turkey is becoming a real regional power," the report says. "There is no other country whose leaders can and do travel so often between capitals as varied as Moscow and Damascus, Tehran and Jerusalem, and be received with respect and be able to advocate important policy goals so widely." More than anything, though, the report urges the E.U. to reaffirm an honest commitment to Turkey's eventual membership. It says the attraction and support of the E.U. has been a vital locomotive as Turkey tries to modernize and reform: "Turkey-E.U. convergence is a positive process that has done much evident good for both sides and it is this virtuous circle that must be re-established." But the biggest obstacle remains public opinion. 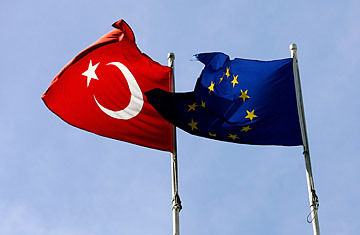 A poll last year revealed that only 31% of Europeans back Turkish membership and in the June European Parliament elections Turkey proved a popular punching bag for parties looking to gain votes, with candidates pledging to veto the country's membership. The current economic downturn is another factor, making the E.U. reluctant to take on another country struggling under recession. "The economic crisis has certainly made things worse in Europe," says Sevket Pamuk, professor of Turkish Studies at the London School of Economics. "For membership to occur, Turkey needs to change, but the current political mood in Europe needs to change as well." The Independent Commission on Turkey report says E.U. leaders should start by challenging popular prejudice, instead of pandering to it. For an example of how popular opinion can change it includes a revealing statistic from the past: in 1954, 51% of French people told pollsters that they had a negative view of the German people and only 29% thought a Franco-German alliance would work. Now, both those countries are standing together in the way of a similar deal with Turkey. Read "Turkey No Longer a Safe Haven for Chinese Uighurs." See pictures of Turkey on LIFE.com.